For ‘Open Heart Surgery’ Faramaway presented a pair of videos installed on a sculptural plinth in front of a series of wall works. The video works, one portrait and one landscape format, hand off to one another, sharing a sublime rendering in which iridescent 3D blobs collide, envelop and obliterate one another to electronic drone music or the sound of waves lapping. 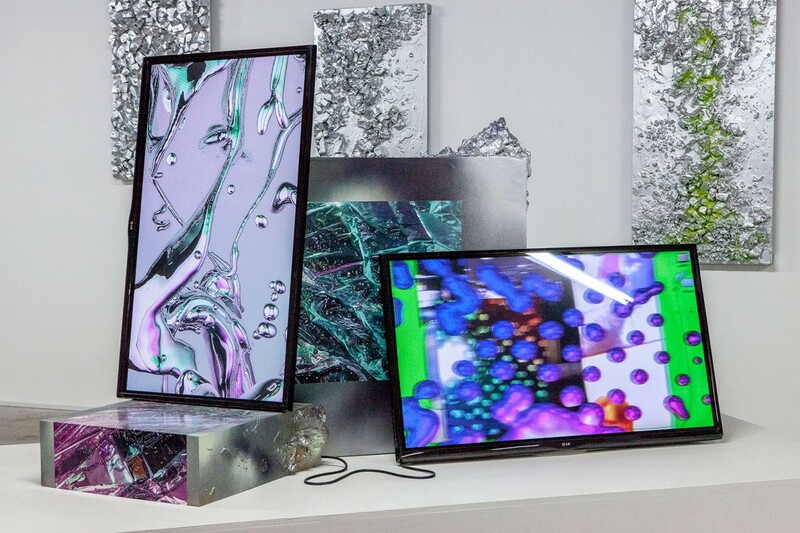 In ‘Trocadero’ this highly polished material is set against’ ‘shaky’ ‘handheld footage of friend’s chatting in the back of a bus and at a video game arcade played on the artist’s desktop, the screen recording layered and distorted with effects in a performed viewing. On the back wall scree paintings simulate in low relief the broken rock fragments that accumulate at the base of crags, mountain cliffs, and volcanoes. This material is coated in a glossy metallic silver that pools at its base and is pocketed by airbrushed sulphuric green spots based on screen savers. The artist has drawn parallels between this series and ‘Liquid Sunset’ a downloadable desktop wallpaper in which an image of a sunset is continuously animated by a layer of CGI liquid that is alternately poured onto and and swiped off of a simulated surface. The operating space becomes a shallow pane on which an image of wanderlust is revealed and withdrawn ad infinitum. In each work there is a visual disintegration as form and surface, image and effect contend. As a whole the installation frames our everyday media landscape as a constant negotiation between facade and immersion – a space lacking an immobile outside point of reference, navigable only by constant reference to the immediate environment. The artist’s real and virtual spaces of operation become a shared stage upon which disparate modes of authorship and viewership are performed side by side.